Alicia Henry, Untitled (Fragments), 2019, acrylic, graphite, pastel, colored pencil, crayon, felt, thread, yarn, paper, cotton, 120 x 96". Alicia Henry’s powerful exhibition “Witnessing” challenges the Western conception of portraiture as an image that reflects both the subject’s body and psyche. Occupying the cavernous clerestory and second level of the Power Plant, the artist’s first solo exhibition in Canada presents her figurative sculptural work made with materials such as felt, canvas, and leather. Although, at times, subtle graphite markings suggest individual faces, Henry’s treatments of the textiles prior to sewing them together—laboriously tanning, boiling, and embroidering them—are what lend the figures distinctive identities. Layering these individualized components as if they were interchangeable parts of paper dolls, she creates representations of both individuals and groups of people. This textural approach to portraiture eschews physiognomic mimicry in favor of generational inheritances, where Henry's durationally processed materials give the appearance of multiple faces superimposed onto each other like masks. 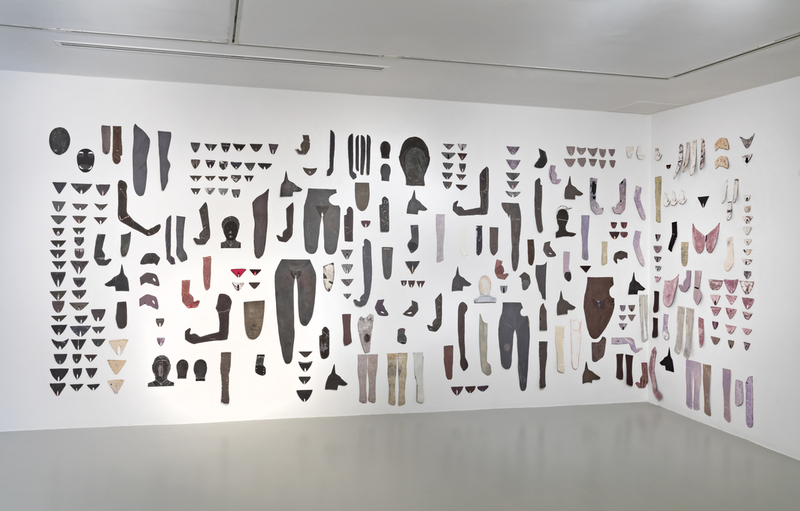 This is most evident in the immense work Untitled (13 Female Figures), 2019, in which figures in quilted dresses are pinned along facing walls; some are connected by long strips of black cotton, suggesting intergenerational ties. Each figure is a distillation of a larger portrait, both part and whole. The compositions within each figure (which Henry meticulously mapped out in preparatory drawings) reflect the same tension, as do the more abstract works, such as Untitled (Fragments), 2019. Here, a sea of flat shapes is systematically sorted by form across two adjacent walls. The individual components appear to oscillate between abstract cutouts and images of heads, arms, and legs, but they never compose a single body. In insisting on this level of fragmentation within portraiture, Henry seems to question the relationship between visibility and identity and, as the artist has emphasized, explore what it is to see and to be seen.